This collection contains “families” of color-coordinated designs in jewel colors like emerald, garnet, ivory, amethyst and sapphire. You’ll have 36 sheets, including 29 papers patterned with words or faux textures, plus 6 sheets of glimmer paper (2 each of burgundy, brown and black) and 25 faux-textured tag cut-outs. 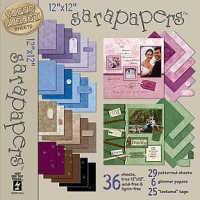 It’s a wealth of beautiful, versatile papers!